An axe-wielding robber who threatened to chop off a post office cashier’s fingers is starting a lengthy jail term. Darren Foster was told by a judge that he had left the woman assistant he robbed “terrified”, particularly as it was the second robbery at the premises earlier in the month. 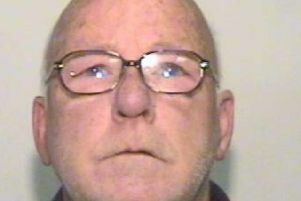 Liverpool Crown Court heard that 54-year-old Foster was seen hiding behind a bush in a garden near the Heath Street post office in Golborne on the morning of August 30. Twenty minutes later he went into the premises with his hood pulled up and wearing sun glasses and assistant Carol Dowdall looked up and saw him stood next to her. The frightened woman understandably opened the till and he grabbed £430 cash and two other female assistants fled to a secure area and sounded the panic alarms. On hearing them Foster, who lived in the same road and was a regular customer in the shop, fled on his mountain bike, said Trevor Parry-Jones, prosecuting. Before he left a woman customer walked in and though he told her to stay where she was she ran to a neighbouring business to call the police. He was arrested the next day at his mother’s home in Golborne and when his home in Heath Street was searched they found a note he had written for his brother in which he said he was sorry but had “gone robbing” to pay his drugs debt. In a victim impact statement Carol Dowdall said that she was no longer the confident person she used to be and what had happened had frightened her. The court heard that at the time Foster had a four-month suspended sentence hanging over him and the judge, Recorder John Gibson jailed him for four years for the robbery and activated the suspended sentence to run consecutively, making a total of four years four months. “You terrorised particularly a member of staff holding an axe over her,” he said. His life had been blighted by use of crack cocaine and heroin and he had a £1,000 drug debt and was frightened what would happen if he did not repay it.